This event gathered academic experts, experts from international financial institutions, companies and diplomats, in a first session, around the political and economic rationale of the Cancun Paradigm shift. 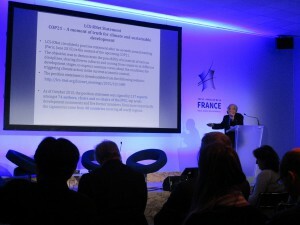 In a second session, it looked at the conditions and possibilities regarding the implementation of innovative initiatives regarding financial mechanisms based a social and economic value of avoided carbon emissions (positive carbon pricing) able to favor a more inclusive growth in North and South countries by COP22 in Marrakech. The session report of each presentation at the first session is as follows. Shuzo Nishioka (IGES) gave a brief introduction about International Research Network for Low Carbon Societies(LCS-RNet) and mentioned that LCS-RNet circulated a position statement after its seventh annual meeting (Paris, June 2015) in the context of the upcoming COP21. One of the objectives of the statement is to express common views about the conditions for triggering climate action in the current economic context. As of October 2015, the position statement was signed by 217 experts amongst 74 authors, chairs and co-chairs of the IPCC, top levels development economists and five former ministers. Even more importantly the signatories come from 48 countries covering all world regions. JC Hourcade (CIRED) emphasised there is a problem in financing the transition with North-South opposition. There will be no real action on GHG limitation as long as those actions do not present sufficient co-benefits. The question is now how to redirect the excess of global savings towards sustainable development and climate change action. He stressed we need for that price mechanisms in which prices are relative to development levels and also need to secure risks for investors. For instance, a price of 50 euros a ton of CO2 would double the price of cement in India, which is not possible. But if those 50 euros are embedded in a safety mechanism, then it is possible. Jim Skea, (Imperial College) mentioned companies would prefer a contract type carbon price type first, then an ETS system in second and a tax system in last because businesses don’t trust governments to keep the price stable. But in any regard, businesses need a price signal on how the carbon pricing will be set. Teresa Ribera (IDDRI) emphasised the missing link to fill in the GHG target gap is the financial side. Political guidance is needed first. She insisted the UNFCCC have the role of providing this guidance in support of this financial movement. She also mentioned that climate action needs to be brought to the mainstream of development. It cannot be considered as an external action, but it has to be linked, and climate action should be treated through the SDGs. Carbon markets: looking at the most efficient way to do trade under a cap, which is a previously established goal. Recognition of social and economic value of carbon reduction, mitigation action. This is a recent notion. Every ton of carbon subtracted from the economy has a value. Brazil is supporting this recognition. Now we need to put this into the finance track. The UNFCCC is the only organization that can give the political support to this notion. For too long the discussion was about which country will give how much to others. This has to stop as governments are indebted. The financial resources will come from elsewhere. This government’s money could instead be provided in support of guarantees of investments. Session 2 : Positive Carbon Pricing and climate finance: what stakes beyond COP21?